Qanah grabbed a historic win over Petrojet while Ultras White Knights invaded Zamalek’s match against Haras El-Hodood, where spoils were shared in the second set of fixtures of Matchday 5 of the Egyptian Premier League. Sunday marked the end of Round 5 of the Egyptian Premier League following yesterday’s set of exciting fixtures, where Al Ahly and Arab Contractors prevailed, with the latter scoring four against Ghazl El-Mahalla’s goalkeeping coach. Five matches were played and there were some very surprising results. Zamalek and Petrojet were both held, Smouha and Beni Suef Telephones both claimed wins over Misr El-Maqassa and Menya, while Ittihad El-Shorta and Tala’a El Gaish played out a goalless draw. 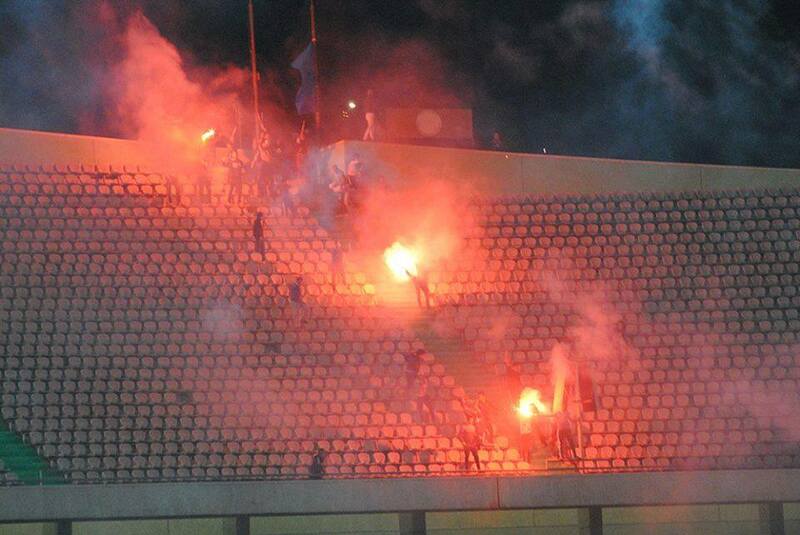 Tarek Yehia’s men succumbed to defeat in Alexandria against Group A powerhouses Smouha. The Fayoum side failed to claim any points from the trip to Alexandria despite going ahead. Maqassa did open the scoring through Hesham Mohamed’s diving header. The former Ahly midfielder took advantage of the gap left in the Smouha defence from Mohamed Thabet ‘Sarouk’ pass and nodded past former teammate Amir Abdel-Hamid. Smouha got the equaliser in the second half, and they were given a hand by Ahmed Abdel-Raouf. The former Zamalek midfielder has vast experience but was guilty of making a terrible mistake. Ayman Ashraf’s cross from the left-hand side reached Abdel-Raouf who tried to chest it back to goalkeeper Mostafa Kamal. Not realising Hamada Yehia was standing in front of him, it reached the Smouha striker who made it 1-1. A gift for Hamada Yehia. Former Ahly player Ayman Ashraf then got the winner when he went through on goal from the left-hand side and finished past Kamal. Menya are in jeopardy. At the start of the season five of our panel predicted them to go down. On Sunday, they were beaten by Beni Suef Telephones. Wael Farag opened the scoring for Beni Suef Telephones. After receiving a pass from Amr Samaka, Farag calmly finished past Atef Noshy to make it 1-0. The second goal was no different. Samaka was on the ball, waited for the barging Farag and the latter’s shot could’ve been kept out by Noshy. Hesham Shehata pulled one back for the visitors with a free-kick which fooled the wall and Ahmed Massoud. Shorta and Gaish played out a goalless draw at Abbassia in which both coaches will be content. Shorta are fifth on six points, while Gaish are eighth with four points, but are yet to register their first win. Emad Soliman’s men have lost only one game, but have registered four draws. Khaled El-Kamash’s men however haven’t lost a single game but have only won one game, drawing three. What a win for Qanah, words simply cannot describe what the win means for them. Mohamed Said’s goal five minutes from time means that the Blues climb to third on eight points. The only goal of the game came through Said who took advantage of Petrojet’s high line and went one-on-one with Mohamed El-Shennawy before rounding the goalkeeper and scoring to win the game for the newly-promoted side. Petrojet on the other hand remain top of the group, but have played one more game than Ismaily who sit in 2nd. The Royals were held at home against Haras El-Hodood in a game which saw Zamalek’s fanatic ultras group ‘Ultras White Knights’ (UWK) invaded the stands with a bang, literally, before eventually leaving. Zamalek took an early lead when Mohamed Ibrahim was brought down by Sayed Hassan forcing the referee to award the home side a penalty, Ibrahim took the corresponding penalty and made it 1-0. Ahmed Salem Safy got the equaliser deep into the second half when he notched onto Abdel-Salam Nagah’s perfectly weighted through pass to finish past Abdel-Wahed El-Sayed.